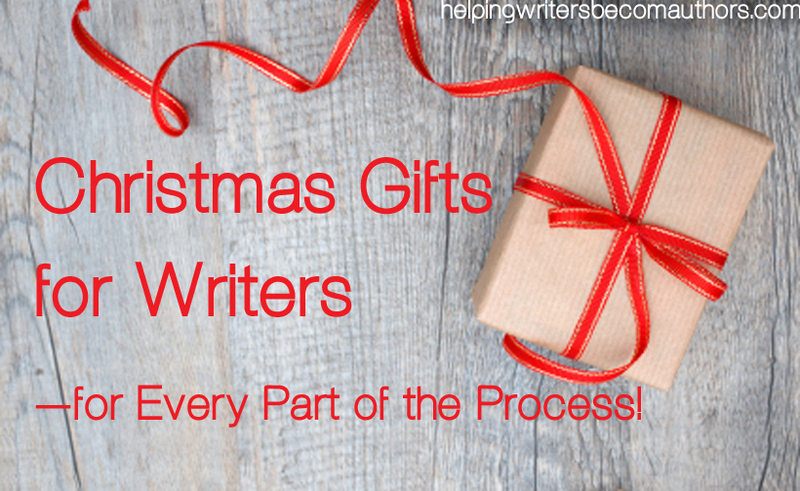 Christmas Gifts for Writers – for Every Part of the Writing Process! Writers are easy to buy for. Get us a book or a pen, and we’ll probably be happy. But why not take it to the next level? Why not grab (or ask for) a gift to help your favorite writer ace every part of the writing process. Shopping for Christmas gifts is always one of my favorite parts of the season. Following are some ideas for gifts for writers. No more great ideas down the drain! Inspiration often strikes in the shower. Make sure you’re ready with this waterproof pad and pencil. Declare your creative passion with a snazzy poster that also reminds you to keep your imagination active. If, like me, you prefer to do your brainstorming and outlining with the raw tactility of pen and paper, save your wrists and fingers with an ergonomic pen. What inspires us more than the blank page? How about the blank page of a super-classy leather journal? Like writing with a pen, but wish you could erase some of those not-so-good ideas? Voila! An erasable pen. Nothing is more annoying than a book that refuses to stay open when you need your hands free to transcribe notes (or eat). Let a bookstand do the heavy lifting for you. These cuties work great for marking the pages on which you’ve made notes or highlighted passages that need to be transcribed into your research notes. While you’re snuggled up with your latest research tome, why not make yourself some literary-themed tea? Jazz up your fingers’ dancing floor with a gorgeous keyboard decal. Taking your writing on the go with your iPad and a handy external keyboard. Keep writer’s block at bay with a reminder to those imaginary friends who keep everything running smoothly upstairs. Flash drive? Check. Pen? Check. Stylus? Check. Haul your edit-in-progress manuscripts around in style. Celebrate the completion of your latest book by buying yourself something special—like a horde of new books and a spancy new Kindle case in which to read them. Throw a book-completion party and get your bibliophile friends together for a game of literary first lines. Tell me your opinion: What writing-related gift is at the top of your Christmas list this year? I thought that one was pretty nifty myself. I love “themed” flash drives. But themed flash drives that are multi-purpose? Even better! If I had my way, I’d be getting a new laptop. But, at this point, I’d just be happy if my husband promised me some alone time to work on my 5 1/2 year old laptop sans children! Mine’s about three years old now too. I have the old Keyboard model, and I really love it. The bells and whistles and general shininess of the new models are tempting me, but, hey, if it ain’t broke don’t fix it! I’ve yet to hear of a Kindle virus, but I can’t imagine they’re not out there. Have you tried restoring it to factory settings? I have those in my shower. They’re great! A tablet would be on my list, preferably 8-10 inches in size. Tablets are great. They’re do-all little machines – although I still prefer the reading-only Kindles for e-books. Fab ideas! Gotta get me some of these things. Thanks for the great ideas! Better than coal in your stocking any day! That Flash Drive Pen is a great find! I’ll definitely be buying it for myself before gifting one to somebody else! And I love notebooks- can’t have too many of them at all. Great list, K.M! Looks like Santa’s going to have to stock up on flash drive pens! Here’s another tote I saw the other day and thought was pretty darn cute. A good idea is Scrivener. I’m right now writing my bachelor thesis in it and I’m recommending it to all my fellow students. I bought it a year ago and still have fun with it. I’ve always been happy with the purportedly similar (and free) yWriter. But I’m about to break down and play Santa to myself with a Scrivener present before I start my next novel in January. You won’t regret it. I don’t know YWriter, but I can’t imagine that it has the same level of usability and features. By the way I just read ‘The Memory Lights’ and found it beautiful. I love to come to Your site and browse the old blog entries when I’m done writing (as a treat). I’m looking forward to Your new steampunk novel! Thank you so much! I’m so glad you enjoyed the story. I’m kind of in love with that bookstand. I’d love to have one of those next to my computer! They’re so handy for transcribing notes. The Aqua Notes has to be my favorite! I get all my book ideas is my sleep, but I brainstorm in the shower. Perfect! What is it about the shower that spawns such great ideas? I actually love the scratchy pens. Something about that sound is inspiring. Plus, gels pens write too smoothly – which makes me write even sloppier than usual! This is a really neat post the way you split it up into gifts for each part of the writing process. I like the idea of a keyboard decal. On my Christmas list, I want Amazon gift cards so I can buy books from my favorite author for Kindle or in print. I’m wild about the decal. Having a hard time finding a good one for a PC laptop though. Thanks for posting this; I was stumped on what to get a friend. Now I’ve finished my shopping. Yay! Great collection! I especially like the typography mug.